Celebratory dinner slated for March 31 at EQC Showroom, noon to 3 p.m. They said it couldn’t be done. No group of citizens had ever changed state law to curb police excessive use of force, and there were plenty of naysayers who thought that Initiative 940 here in Washington would surely fail. However, building coalitions and being willing to talk things out proved to be the winning combination for I-940 and ESHB 3003 to be passed by the state legislature right before the session ended earlier this month. It was the Puyallup Tribe linking arms with De-Escalate Washington that led to achieving this historic event, with the Tribal Council unanimous in voting to give De-Escalate Washington its largest donation early in the campaign and the tribal membership stepping up to take part in gathering the more than 350,000 signatures necessary for I-940 to be certified. Tribal Councilmember Tim Reynon, vice chair of the I-940 leadership team, told of how I-940 came to be signed into state law just in the nick of time before the legislative session came to a close, and how its counterpart ESHB 3003 came to be. Initially, thoughts were that the legislature would take no action on the matter this legislative session, which would have meant that I-940 would have been on the statewide November ballot for a vote of the people. But old-fashioned communication among the interested parties did the trick – talking around the table to come to mutual agreements that had everyone’s best interest at heart. Slowly but surely, progress was made such that during the last week of the legislative session the work group really started to collaborate well to hammer out the language and agree upon changes to the deadly use of force language. Together, I-940 and the agreed upon policy in ESHB 3003 strengthen and clarify the measure so that implementation goes more smoothly and the legal standards for the “good faith” standard are clearer. “It was essentially strengthening the language of the initiative to where both parties could accept it,” Councilman Reynon said. Require violence de-escalation and mental health training. Require first aid training for all officers and require that police render first aid at the earliest safe opportunity. Removes the de facto immunity and adopts a reasonable officer standard. Requires completely independent investigations of use of deadly force. Requires notification of tribal governments where a tribal person was injured or killed. Brings diverse community stakeholders into the process for input on policy. “With this initiative in place, the number of deaths by police officers should go down,” Councilman Reynon said, as Justice for Jackie’s Lisa Earl quickly added, “as well as (police officer deaths) numbers going down too because they’ll have that training and not rush in to situations….” Earl, who lost her daughter Jacqueline Salyers to police violence, said that the passage of I-940 does not mean that Jackie’s fight is over. How the initiative was passed has rankled a few, including local conservative political activist Tim Eyman, who has filed a lawsuit asking the court to order the Secretary of State to put I-940 and ESHB 3003 on the November ballot. Puyallup Tribal Councilman James Rideout stands firmly that passage of the initiative and house bill did not breach the initiative process. Now comes the work of implementing the new laws, and a schedule has been created laying out exactly when things will happen. I-940 officially goes into effect this summer, June 7, then the Criminal Justice Training Center will have six months to adopt rules for curriculum and hours for violence de-escalation training and mental health training for officers, and one year to develop guidelines to implement the duty to render first aid. Clocks also start for rulemaking for independent investigations of use of deadly force. 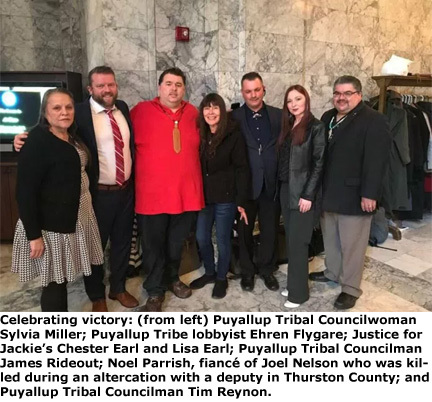 ESHB 3003 will be effective on June 8 and among its requirements for guidelines will be to construct a detailed process for notifying tribal governments when a tribal member is involved in a deadly police shooting. Councilman Rideout, uncle of Jacqueline Salyers, and Salyers’ cousin Chester Earl have been involved in securing police reforms ever since Jackie passed away. Chester Earl said the movement is spreading, too. “This is the very first time in the nation that people have taken a police issue to the ballot through initiative. Now Alabama and Texas are working on the same issue so we’ve already set the model for the nation,” he said. Councilwoman Sylvia Miller was there as well, right by Lisa Earl’s side whether attending evening meetings, marching with Justice for Jackie or cooking food for gatherings at the Youth Center. “There were two Council members who didn’t have to show up to those meetings in the beginning, and that made a difference – that gave us hope and inspiration that we could get something done,” Councilman Rideout said of his fellow Council members Tim Reynon and Sylvia Miller. “Tim put in nearly two and half years of work into this non-stop and we love the hell out of him for representing us and helping our people,” said Chester Earl. Others to thank include Sarah Morkin, Jobs With Justice; De-Escalate Washington Policy Director Leslie Cushman; Loretta Gutierrez-Sacks, Coalition of Black Trade Unionists; the Puyallup Tribe’s lobbyist Ehren Flygare; lobbyist Lindsey Grad with Service Employees International Union (SEIU) and lobbyist Elizabeth Smith with the ACLU, along with all the members of the De-Escalate WA leadership team and Law Enforcement leadership from WASPC, WACOPS, and FOP. Councilman Rideout gave a special shout-out to the Diaz Bradley siblings – Joseph, Julie and Josephine – for making more than 300 signs calling for safer communities and replacing them around the reservation when they’d get torn down.